I will submit your website in 10 blog comments backlinks manually 100% and high quality you not worry about quality of comments we submit , because our work to provided 100% quality to our clients . 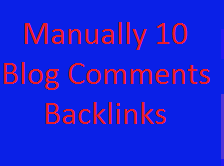 I will Manually Do 10 High Authority & Manual Blog Comments Backlinks is ranked 5 out of 5. Based on 2 user reviews.